Posted in: 1 Pageant Pages, 2 Shout-out-Looks. Tagged: Bb. Pilipinas Supranational 2017, Boy Abunda, Chanel Olive Thomas. Bb. Pilipinas Supranational 2017 Chanel Olive Thomas was all excited when she solo-guested on ABS-CBN’s “Tonight With Boy Abunda”. She had long wanted to get this chance to be interviewed by the popular host. And she did. With a bonus of fast talk at that. Watch the videos now and give me your impressions, dear readers. during MEP stint nya. naalala ko marami syang critics d2 may mga below the belt at tama lang. and now halos tawagin na syanh channel of the Philippines. i so love this. honestly hinde ko din sya na feel b4 on her MEP stint nya until b4 the bbp finals. parang sa isip ko. minaliit ko ung pagiging half nya. kung baga. mapapansin lang sya ng mga judges dahill half. but after her performances during bbp never mind her styling and gown. i was like. OMG!!! crown this girl! and when she got the bbp supranational title. parang gusto ko syang hilahin at ipadala sa supra org. sobrang saya that she won. sobrang saya that this high calibre beauty queen wanted to represent our country in MS. ung performance nya during bbp parang naglalakad lang sya at nagmamadali at nagpapacute. pero umeffect at na feel naman sya. But hopefully wag sana ganon ang peformance nya sa supra. or medyo ganon but sana more than that. medyo ayusin pa. wala din naman siguro i worry kung ganun pa din ipakita nya sa finals since ganon talaga personality nya, natural at bagay na bagay sa kanya and nakakaaliw naman and d lang sya basta basta since may laman din ang utak. so i think the 2nd crown is coming. other than that she looks like a winner!!! Is it just me or she looks like an exotic version of Nicole Kidman? Ang bruha nag bobloom. Basta just make her look fresh all the time. She already has the personality sealed. Just need physical training and make up. Oh Chanel di kita gusto dati pero grabe ka lalo kang gumanda after you won. This girl is a strong contender for MS infact ready cya kahit MU na bukas. 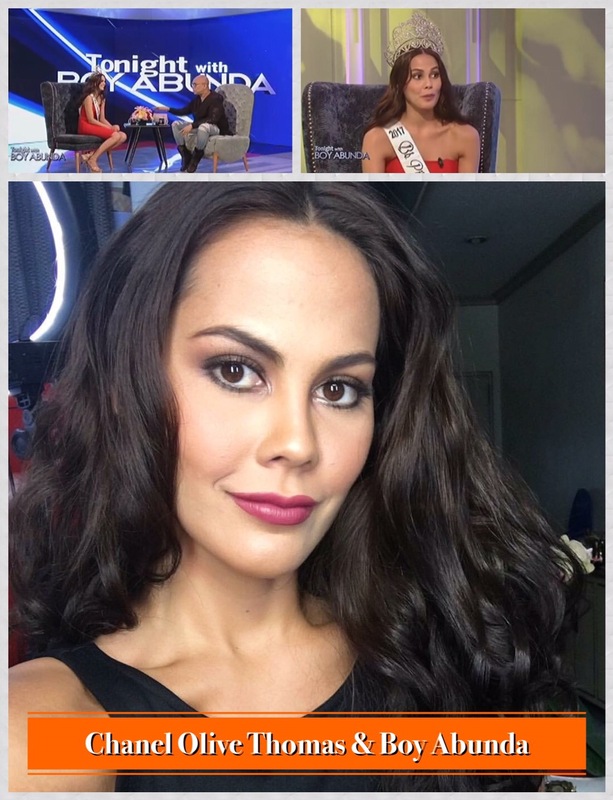 Dito sa Boy Abunda interview parang Catriona Gray – Angela Visser ang bruha. Ikaw na! Sina Maxine Medina, Kylie Verzosa, Christi McGarry at Nichole Manalo na mga Beauty Queens ang mga maglalaro ngayon sa pinaka intense na laro sa telebisyon ang Jackpot En Poy sa Eat Bulaga ngayong May 17, 2017. Panoorin! JawzKuh, Nilait ko toh noon na wiz maganda pero i was wrong, very very very wrongggg. I recall there was a time during the Miss USA pageant when they had this “Fast Talk” as a Q&A segment, but in the form of a rapid/ambush media/press conference. Not-superficial questions were hurled in rapid succession at the semifinalists. Wit. Nerves. Conviction. Grit. Passion. Eloquence. Humor. Silliness. Levity. Fear. Courage. CLASS. They should also do this at BBP! At Mister Supranational last year, it came out as an impromptu query to the last guys standing, as “What do you want this Christmas?’ given that the competition was held in late fall-early winter. The winning response came from Mexico’s Diego Garcy : more time to spend with his co-candidates and now-friends. Wonder if they will also do it this year at the Miss pageant? An impromptu question requiring quick thinking without sacrificing precision. And we thought Europeans don’t give weight to the Q&A. They just made it less formal and thus MORE REALISTIC.